(Nanowerk News) Printable robots — those that can be assembled from parts produced by 3-D printers — have long been a topic of research in the lab of Daniela Rus, the Andrew and Erna Viterbi Professor of Electrical Engineering and Computer Science at MIT. 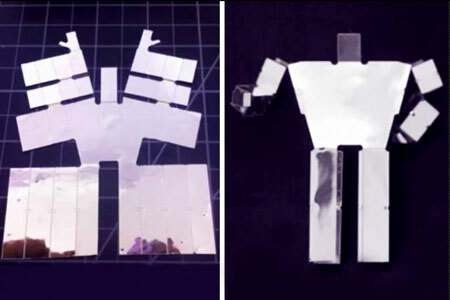 New algorithms and electronic components could enable printable robots that self-assemble when heated. The key difference in the new work, explains Shuhei Miyashita, a postdoc in Rus’ lab and one of her co-authors on both papers, is a technique for precisely controlling the angles at which a heated sheet folds. Miyashita sandwiches a sheet of polyvinyl chloride (PVC) between two films of a rigid polyester riddled with slits of different widths. When heated, the PVC contracts, and the slits close. Where edges of the polyester film press up against each other, they deform the PVC. Imagine, for instance, a slit in the top polyester film and another parallel to it in the bottom film. But suppose, too, that the slit in the top film is narrower than that on the bottom. As the PVC contracts, the edges of the top slit will press against each other, but there will still be a gap between the edges of the bottom slit. The entire sheet will then bend downward until the bottom edges meet as well. The final angle is a function of the difference in the widths of the top and bottom slits. ByoungKwon An, another of Rus’ students, is lead author on the paper describing the system for interpreting 3-D images. He’s joined by Rus, Miyashita, Demaine, and five other researchers both at MIT and in the lab of professor Robert Wood at Harvard University. Miyashita is lead author on the other paper, whose coauthors include, in addition to Rus, researchers at the University of Zurich and the University of Tokyo. In that paper, the researchers describe using a polyester coated with aluminum to create foldable electronic components. Miyashita designed those components by hand, since it was necessary to prescribe not just their geometric properties but also their electrical properties. The sensor Miyashita designed looks kind of like a small accordion. Each of the accordion folds contains a separate resistor, and when the folds are compressed, the total resistance changes proportionally, with a measurable effect on a current passing through the sensor. The actuator — which would enable a robot to move — is a foldable coil, which would need to be augmented with a pair of iron cylinders that could be magnetized by an electrical current. Aluminum isn’t a good enough conductor to yield an actuator that exerts much force, but a copper-coated polyester should do the trick.